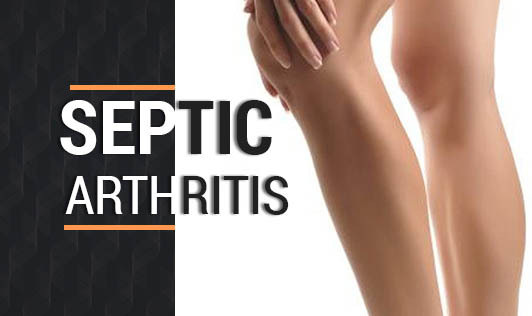 Septic arthritis is the infection of one or more joints by microorganisms. The joint can become infected with germs that travel through your bloodstream from another part of your body. The most common joints affected are the knees and spine. This condition can severely damage the cartilage and bone within the joint, so prompt treatment is crucial. Young children and elderly adults are more likely to develop septic arthritis. People with an opened wound, with a weakened immune system and those with conditions such as cancer, diabetes, intravenous drug abuse, immune deficiency disorders have a higher risk of septic arthritis. Contact your doctor immediately if you experience sudden onset of severe pain in a joint!